Figure 1. Project Area Map. Credit: Stantonsburg Road/Tenth Street Connector TIP Project U-3315 Finding of No Significant Impact report. A major rail line currently bisects Greenville and creates difficulty for road users trying to make east-west connections. At the same time, there is no quick, easily accessible connector route between two high volume east-west streets: 10th Street and Stantonsburg Drive. The proposed road and bridge up to and over a CSX railroad line would create a vital, safe connection for road users of the university area in the east with the medical district to the west in Greenville, North Carolina. Currently motorists, bicyclists, and pedestrians must cross an at-grade railroad crossing and use the two lane undivided Dickenson Avenue and four lane undivided Fourteenth Street to travel between Stantonsburg and Tenth Street. Between 12,200 and 15,400 vehicles per day use this 1.3 mile route and projections forecast increases in vehicle use. Since vehicles must yield to train traffic and the route is non-direct, it causes delay for all road users, which is especially a concern for ambulances traveling from east Greenville to the hospital. Additionally, there are discontinuous sidewalks and no bike facilities in the three areas affected by the project. Of the three affected areas, the medical/governmental area lies just west of the project and includes Vidant Hospital (formerly Pitt County Memorial Hospital), the East Carolina University Health Science Campus and governmental buildings. The second area, the Farmville Boulevard/Fleming Street Area contains mostly low density residential and is located in and around the western part of the connector project. The final area is the downtown and tobacco warehouse area which includes East Carolina University’s main campus, higher density governmental and commercial land uses with some industrial facilities. This area is located in and around the eastern part of the project. Figure 2. Proposed grade separation over CSX Rail Line and Dickinson Avenue. Credit: Stantonsburg Road/Tenth Street Connector TIP Project U-3315 Environmental Assessment. Hospital (PCMH) was formed in 2003 to address the need for a direct connector between downtown Greenville / ECU’s main campus and the PCMH/Health Science Campus. This partnership has funded planning studies in the hope that such investment would expedite its construction. 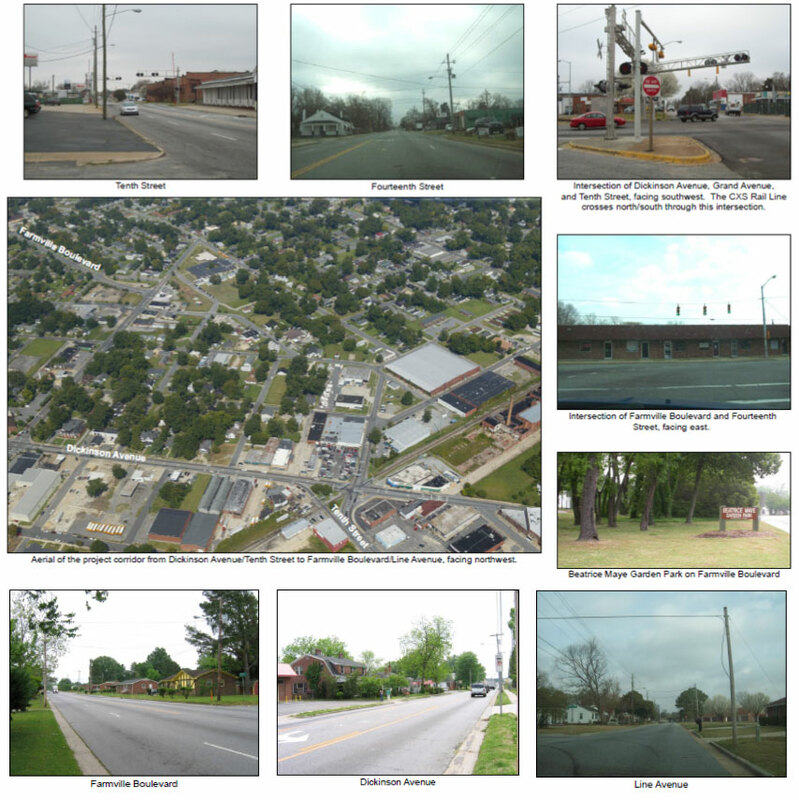 The Greenville City Council unanimously voted to provide bond monies for the Stantonsburg Road/Tenth Street Connector in August 2004. 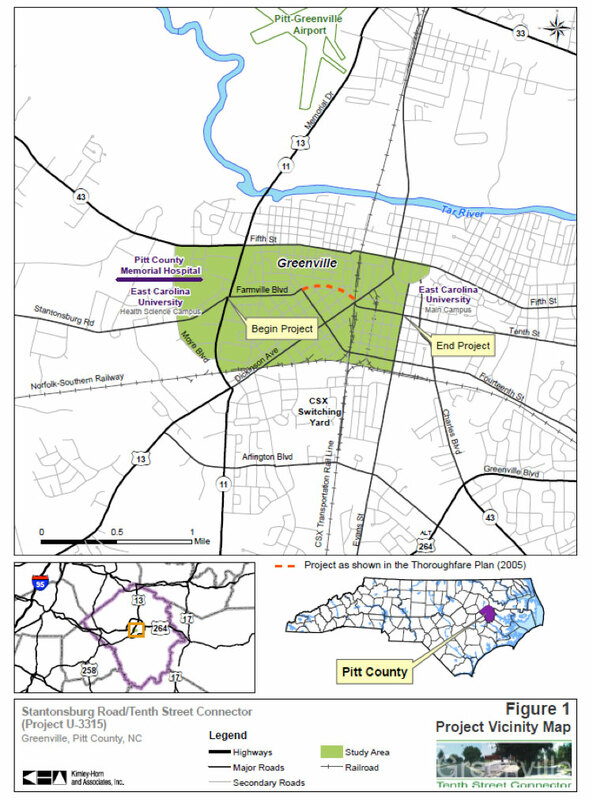 The Stantonsburg Road/Tenth Street Connector was first proposed in the 1994 Greenville Urban Area Thoroughfare Plan (adopted September 1994). Through these actions, it is evident that the various stakeholders have a strong desire to see the project to completion. In part due the stakeholders’ efforts, the project is now in right of way acquisition phase. As of late October 2013, about 90% of the right of way has been acquired and construction is scheduled to begin in late 2014, if there is not a need to move utilities. The project funding is with the 2013 State Transportation Improvement Program with a cost of $47.4 million. The City of Greenville has agreed to financially provide new sidewalks, improved lighting, and extensive landscaping along the corridor. The road corridor will be a four lane highway that is divided by a 23-foot median. The facility will carry 4 foot bike lanes and 6 foot sidewalks behind the curb. This wide cross section does offer the option to upgrade the road for increased transit needs in the future. Bicyclists and pedestrians that already commute between ECU and the ECU Health Science Campus and Pitt Hospital, will now have less dangerous, more pleasurable commutes with better facilities. At one point in the planning process, there was a discussion as to whether to have on road bike lanes or off road, multi-use paths shared with pedestrians. In the end, decision-makers weighed the concern that “strong and fearless” bicyclists would use the road with or without bike lanes, and decided to provide for roadside bicycle lanes. With more right of way than the bridge, the western project component will also serve as a gateway to Greenville with a park-like open environment of a tree-lined boulevard with enhanced lighting, landscaping with numerous trees and shrubs, and generous open space. The project will provide a direct east / west connecting link between the City’s two major economic drivers….the medical district and the University area. And in so doing, removes the conflict with daily RR crossings at Dickinson. 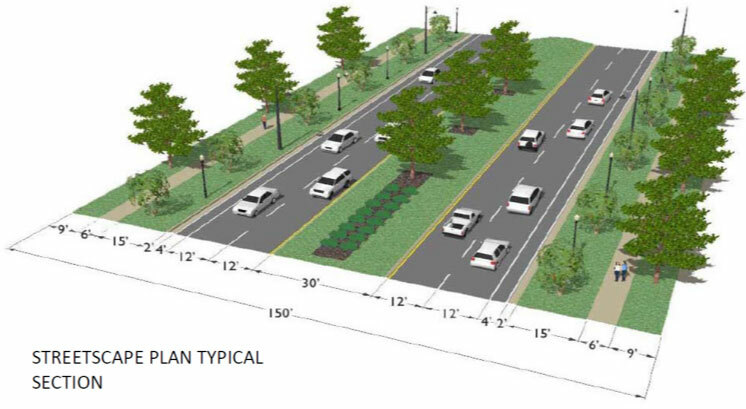 In addition, a center median will introduce much needed access management throughout the corridor. Delays to motorists will be significantly reduced….travel time will be decreased….potential conflicts will be reduced and safety will be dramatically improved. Quality of life, as it relates to commuting traffic will be improved. While motor vehicle traffic will receive several improvements, the addition of pedestrian and bicycle improvements will lead to a reliable, safe, and enjoyable corridor for all users of the new connection between two major districts in Greenville. Figure 4. Project Area Pictures. 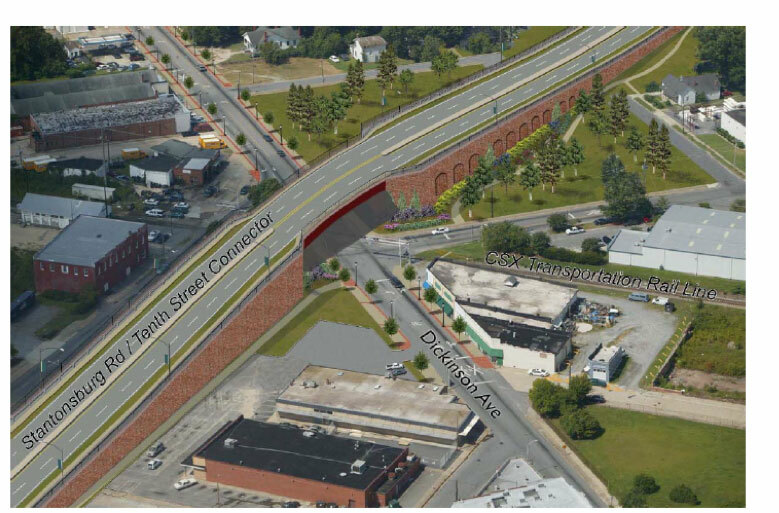 Devens, T. (2013, November 15) Discussion of Stantonsburg Road / Tenth Street Connector. DiCesare, R (2013, November 14) Discussion of Stantonsburg Road / Tenth Street Connector. Hamilton, S. (2013, October 25) Discussion of Stantonsburg Road / Tenth Street Connector. N.C. Department of Transportation. (2012, January 24) Stantonsburg Road/Tenth Street Connector TIP Project U-3315 Finding of No Significant Impact. Retrieved from Ted Devens November 14, 2013. N.C. Department of Transportation. (2010, September 29) Stantonsburg Road/Tenth Street Connector TIP Project U-3315 Environmental Assessment. Retrieved from Ted Devens November 15, 2013.